* Bumstead's Pub: Located in the heart of the downtown district just blocks from the Myrtle Beach Boardwalk, this popular English pub becomes a home for American football fans in the fall. Featuring several big-screen TVs that can be seen throughout the bar, Bumstead's Pub also has smaller TVs in each booth, so fans can tune into the game of their choice. Bumstead's also has a wide selection of beers from around the world and excellent food – both from its own kitchen and the adjoining Dagwood's Deli, which makes some of the fattest subs in town. On Sundays, Bumstead's becomes a major rallying spot for fans of the Washington Redskins. 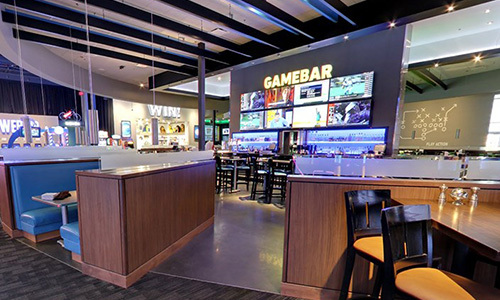 * Dave & Buster's: The latest addition to the Myrtle Beach sports bar scene is a big one. This world-famous chain, which offers the best in food, drinks and video games, also makes it easy to watch your favorite team play with an endless number of big-screen TVs scattered throughout the massive facility. Take a break from all the high-tech video games, including sports-themed amusements where you can challenge your friends to a friendly contest before kickoff. Then it's off to the sports bar to enjoy cold beer, hot food and a good time cheering for your team to bring home a victory. * 8th Avenue Tiki Bar & Grill: Here's the ultimate way to watch a football game in Myrtle Beach – with an incredible ocean view on one side and a great view of the action on a big-screen TV. Although technically not a sports bar, the 8th Avenue Tiki Bar carries all the big games while also offering patrons the option of sitting on the patio deck and soaking up some warm autumn sun. Located just a short stroll down the Myrtle Beach Boardwalk from the resort, “Eighth Ave.,” as locals call it, has a regular crowd mixed with tourists for a unique vibe and a wide variety of fans. Enjoy “Funday Sunday” food and drink specials, and take the Mystery Beer Challenge for a chance to win a free cold one. * King Street Grille: Here's a great way to enjoy a fun day at The Market Common without having to miss your team in action. Stroll around all the shops or play in the nearby Grand Park before game time, then head to this Charleston-based chain of sports bars that puts the food on the same level as the games. Get a table in the dining room, where there isn't a seat in the house that doesn't face a TV, or post up at the bar for viewing multiple games at the same time. On sunny weekends, King Street opens up the patio so you can catch the game and some sun at the same time. * Pine Lakes Tavern: Party like a local at this popular sports-themed gastropub, which also offers indoor and outdoor viewing. The bar area has lots of TVs and fans cheering on their favorite teams, while the back patio overlooks Pine Lake for scenic waterfront dining, drinking and viewing. Located near the historic Pine Lakes Country Club, the first golf course in Myrtle Beach, this place attracts an eclectic crowd of golfers, musicians, surfers, foodies and sports fans. It's a great place to watch a game or just to hang. After rooting for your team, head back to the oceanfront Bay View on the Boardwalk for a wonderful vacation experience. Located in the heart of the Myrtle Beach Boardwalk, Bay View Resort offers comfort and easy access to the beach and all the downtown attractions for a fun getaway, regardless of whether your team wins or loses.